The German Women’s Cup (DFB-Pokal der Frauen) Round of 16 matches were held all around the country on Saturday and Sunday. Last season’s losing finalists FC Bayern Munich scored a convincing 3-0 win against SV Werder Bremen on Saturday, while 1. FFC Turbine Potsdam registered a 3-1 away win at MSV Duisburg in the second game of the day. Defending Women’s DFB-Pokal champions and top favourites VfL Wolfsburg had no difficulties against FC Forstern yesterday. Wolfsburg defeated the 3rd Division (Regionalliga) side 9-0 in a one-sided match on Sunday. Women’s Bundesliga (Allianz Frauen-Bundesliga) club SGS Essen, led by Indian origin midfielder Manjou Wilde, suffered a major blow to their ambitions as they couldn’t overcome league rivals SC Freiburg. Freiburg won the match 4-0. 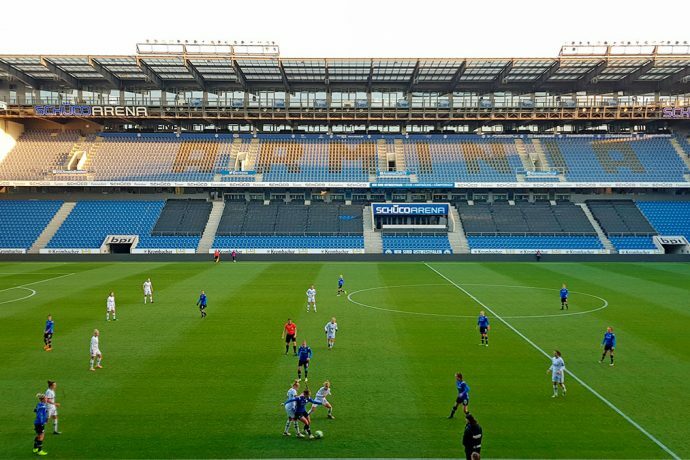 Regionalliga club DSC Arminia Bielefeld displayed a spirited performance in a 1-2 defeat to Bundesliga side Bayer 04 Leverkusen at the SchücoArena.